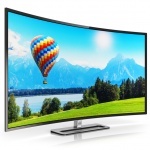 Are Curved TVs Worth the Money? Curved TVs claim to offer a more immersive and high-tech opportunity, but does the curve really improve the viewing experience? One of the claims about curved screens is that they can provide a more immersive viewing experience, making you feel like you’re watching a TV with a screen larger than it is. While the concept seems nice, research has shown that the claimed “immersive effect” doesn’t start until you get to a larger television -100 inches or more – screens. Proponents of curved screens also say they improve contrast by focusing the light coming from the screen more directly at viewers, and that the curve helps to improve the viewing angle for those watching the sets from an angle, at least up to a certain point. But research has shown once again that there aren’t any noticeable benefits with television screens 65-inch or smaller. Curved screens are more expensive to produce, so you’ll pay a decent amount more than you would for a comparably sized flat-screen sibling. The curved shape actually makes it harder to spread light evenly across the panel, which could affect brightness uniformity. And for those viewing the TV at an angle, the curved screen can introduce some subtle geometric distortion of the image, which can result in eye fatigue as your brain tries to compensate for the effect. The curve creates subtle geometric distortions. The most prominent is the slight bow-tie shape, where the edges of the screen seem larger than the middle. It’s most noticeable on letterbox bars and other content with horizontal lines that stretch across the screen, but again, it’s not that obvious from the standard position/distance. As you move off-angle, the distortions increase. The near edge seems larger than it should be, and the middle to far middle seems too small, before growing again at the far edge. A flat TV also has its own distortions, of course, but to me the ones on the curved TV are slightly more obvious. Curved screens are more an aesthetic statement than a real improvement in the TV-watching experience. If you find the curved shape appealing and don’t mind paying a premium for a set that will admittedly stand out from most other models, by all means go for it. But if your goal is heightening the immersive viewing experience, our advice is to use that extra money to buy an even bigger flat-screen model, and add a sound bar or other audio system that can recreate the movie theater experience. This entry was posted in Audio Visual News & Updates. Bookmark the permalink.